Olive green Sniper, No Need to Run, You'll Only Die Tired with man in crosshairs logo in white print. The front has a large man in crosshairs with slogan across the chest. Excellent match for the urban or woodland team outfit. Printed in the UK. The t-shirt is made in 185 gram 100% pre-shrunk cotton and has a seamless reinforced crew neck, and taped shoulders. Twin needle stitched. 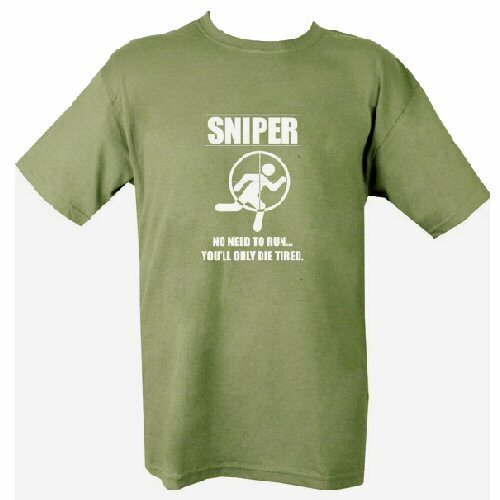 The t-shirt follows the traditional US army cut with non-cuffed sleeves. Length is optimsed for heights around 5'10. The chest sizes are as follows: S (35in), M (38in), L (41in), XL (44in).